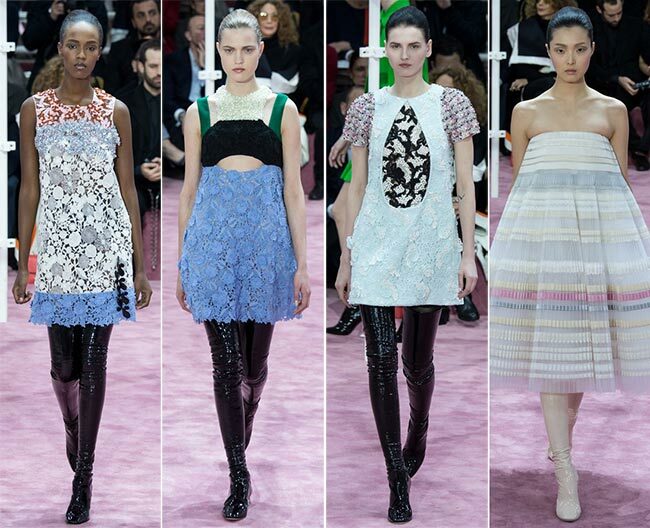 Dior is one of the most revered names in fashion and definitely the archetype of the Parisian Fashion House. Founded in 1946, the brand offers a wide array of luxury goods to tantalize any palate. 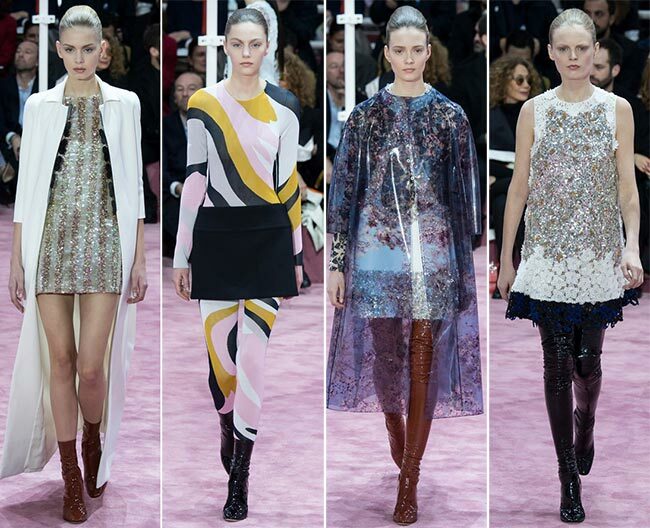 With its ready-to-wear fashions, leather goods, trending accessories, footwear, timepieces, fragrances, make up and all types of skincare products, the Christian Dior brand offers every woman a fantastic experience in the lap of luxury. 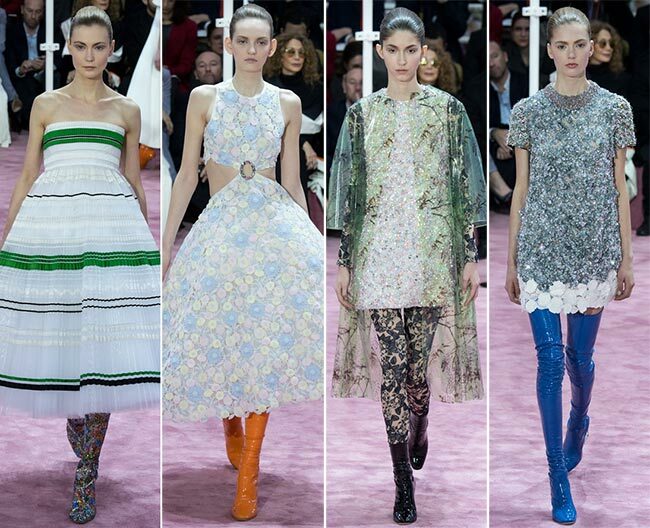 Furthermore, the fashion house is greatly known for maintaining its traditions in creating amazing haute-couture lines, including the Christian Dior Couture spring/summer 2015 collection that has just ben launched in the framework of Paris Haute Couture Fashion Week. We are looking at lots of color, with great contrasts in each piece presented. Drill hemmed knit skirts in black, blue, red, grey and white have been spotted on the runway, along with thigh-high shining latex boots. We have dizzying designs in bodysuits and gorgeous dresses with full A-line skirts. Bright neon greens also mark many of the pieces, including a short coat with silver lined slits along the sides. 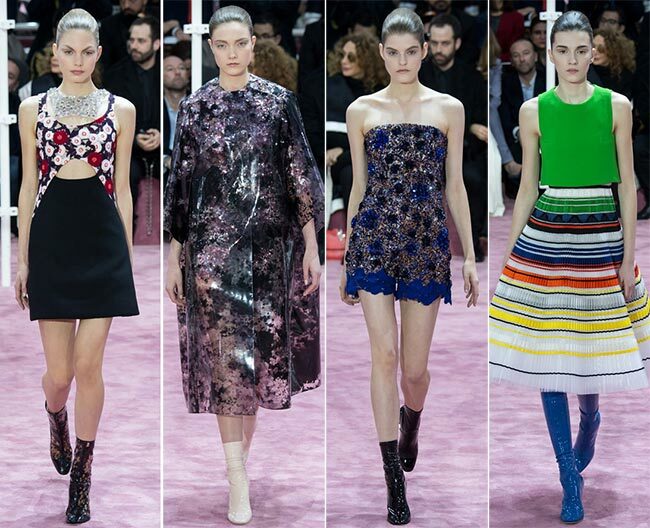 Swirling colors take over the whole of the Christian Dior Couture spring/summer 2015 collection, creating a rather intriguing masterpiece, while mini poinsettia print floor length dresses appear on the catwalk. There’s a rather intriguing focus on the bandeau style over the chest area, with high skirts and bared skin just over the ribs. 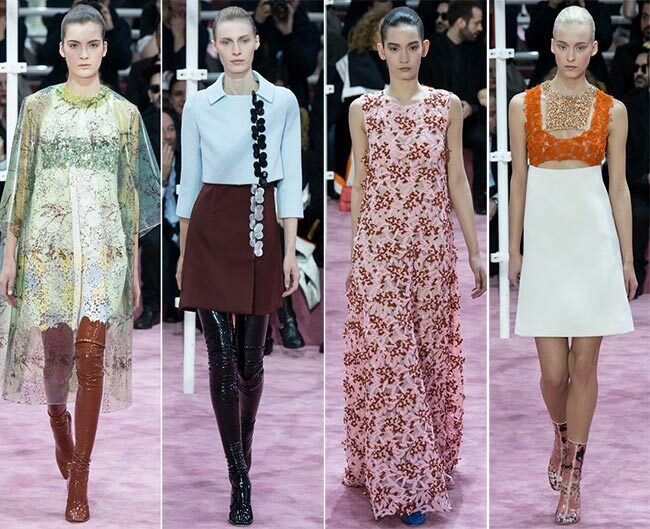 There is a whole lot of floral and generally intriguing style within the whole of the collection. Nearly every single pair of boots worn across the line is of colored latex, be it green, blue, red, purple, orange, brown or black. 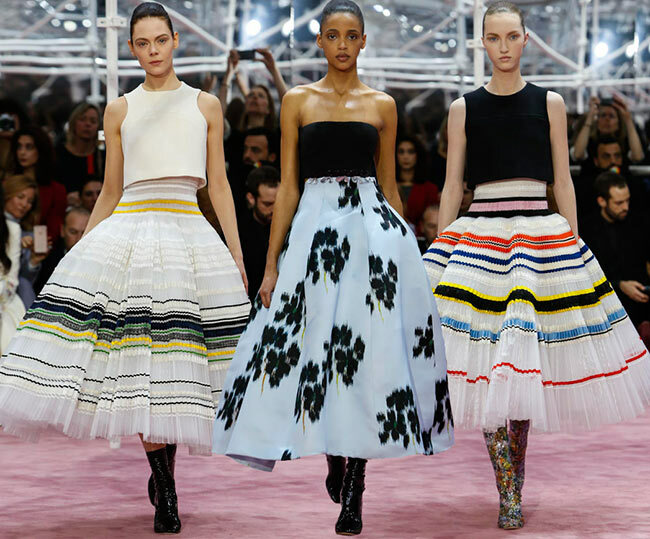 While so many of the Dior couture dresses were simply a little too much for daily wear (which is exactly what couture fashion is about), we can certainly see the full-skirt number being sported at some rather interesting parties. The fitted waist of the full A-line skirt that’s been puffed for added effect creates a rather lovely silhouette, while the simple cropped top in white does well to bring the focus lower and create a more balanced appeal. The same look in yellow and simple white, as opposed to the black, yellow, grey and white banded skirt, are also available and are just as eye-catching as this one, particularly the bright yellow with floral print patent leather boots and the same style of frill hemmed banded design. 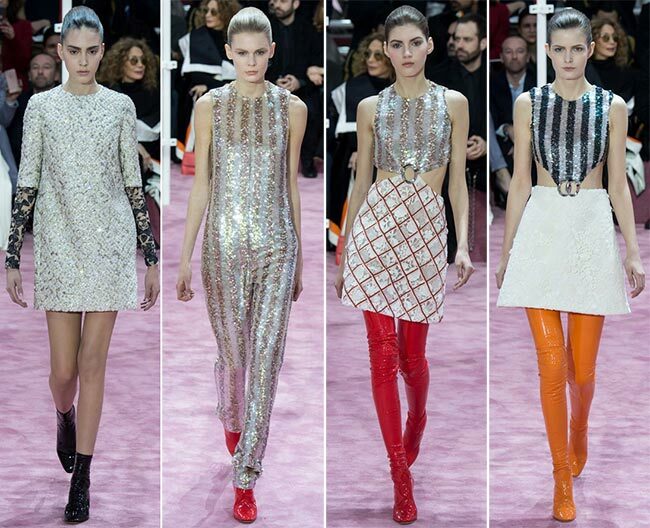 While the jumpsuit or onesie style of the sequined number looks rather strange on its own, the mini dress version with orange latex half-boots and a soft pink sleeveless jacket thrown over, accentuating the silhouette and falling in lengths to the ankles, is certainly more our style. The dress itself falls simply, the striped design cutting up the body into multiple sections, while the short hem offers a full look at legs that would not be seen from the back. 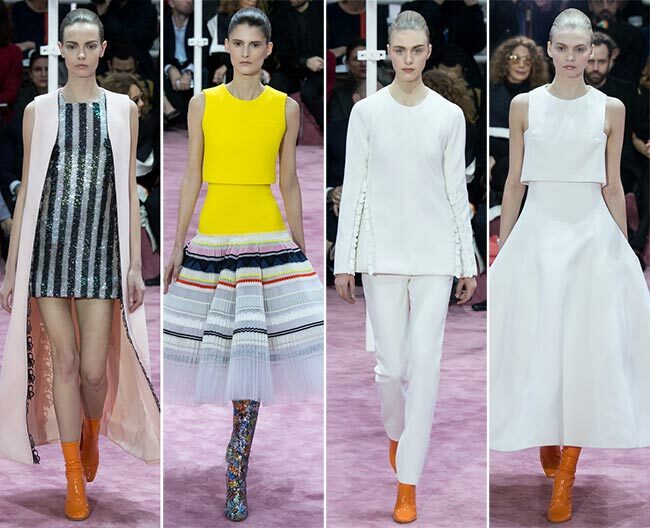 It’s a great look and certainly lovely Dior Couture. Sequined designs translate into rather intriguing retro superhero dresses as well, with the striped top creating a V-line where it connects to the high fitting skirt that in itself has a shorter hemline but allows no skin to be shown due to bright orange thigh-high latex boots. This means that the sides and the mid-back of the body are exposed, the skin shown off in a chic manner. It’s an interesting look and rather reminiscent of Wonder Woman. 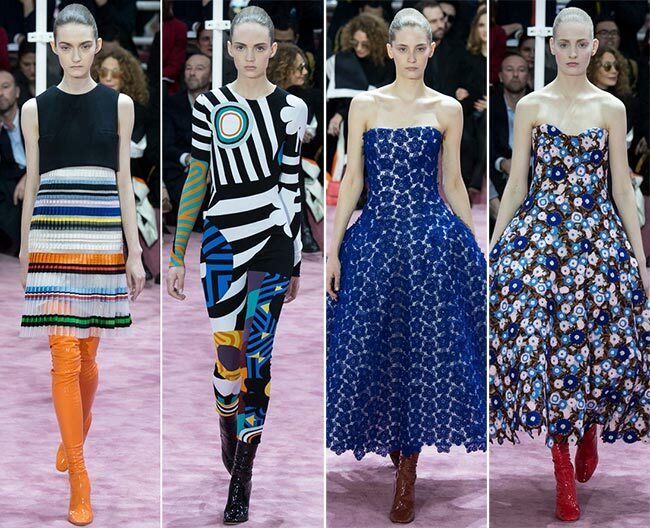 Raf Simons seems to be using the Christian Dior Couture spring/summer 2015 collection to up on the optical illusions, creating bodysuits that would be fit to use on a battlefield as it would confuse both animal and enemy alike. 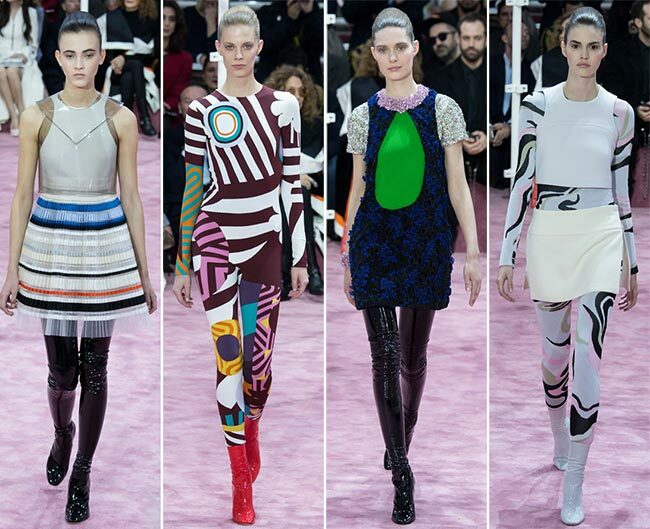 It’s all swirls and camouflage coloring, with feet clad in black latex boots. The printed skin-tight jumpsuit is the intriguing piece within the whole of the line-up we might actually use for sun events that require you to play costume dress-up.